This is me tearing it up n the garden at Corazon Maya. I knew it was coming, but that didn’t mean I had to like it. 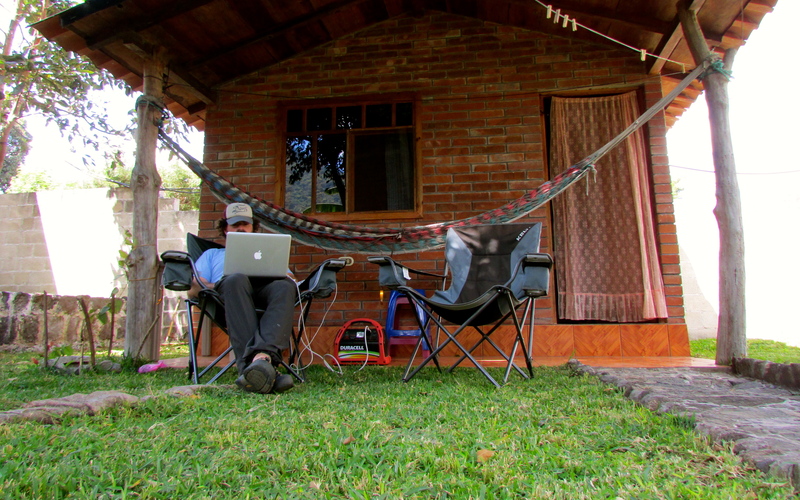 After two weeks in this super fun town called Antigua, we were headed back to Lake Atitlan. In case you’re new to my blog, I’m a pretty easygoing dog. I love people, I’ll eat just about anything and if you give me a sunny day and a lap to snuggle in, I’m pretty much good to go. There are only a couple of things I don’t like, and one of them is big bodies of water (I’ll get to the other thing later). So to put it simply, knowing we were about to spend some time on the edge of a giant lake, that very same lake I was forced to ride back and forth across in a tiny boat, and I was less than a happy camper. As always, My Family didn’t ask for my vote. So we left the nice people at the Tourist Police at drove off for the lake. 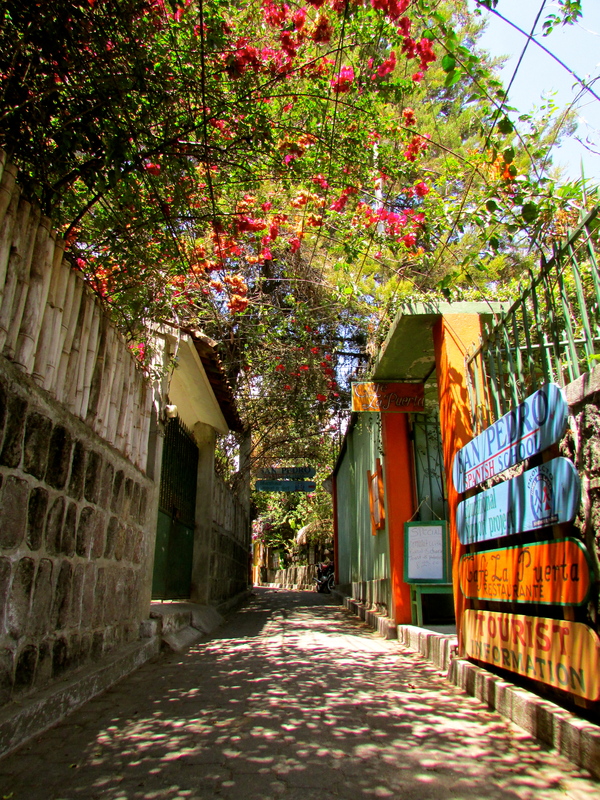 The roads to Lake Atitlan (or Lago de Atitlan, as the locals call it) are pretty smooth, but boy do they twist and turn! We spent a bit of time on the actual Pan American Highway, something we hadn’t done since early in our travels through Mexico, and then turned off to head down towards the lake. Our destination was the town of San Pedro, which was one of the places we had visited with my Grandparents two weeks before. We were taking another road down the huge mountain towards the lake. Holy cow, I had never seen such a steep road before! Jason smelled awfully nervous as we slowly made our way down. At one point in the trip, Jason pulled us over to give the big truck’s brakes a break. They weren’t that smelly, but I could tell for a moment that Jason wasn’t sure how the rest of the trip was going to go. Victoria walked me around so I could sniff the delicious scents of the jungle, while Jason hunkered down to watch the other trucks go by. Seeing these huge vehicles packed with logs, metal bars or dozens of people with their bags rocket down the hill way faster than we had, Jason seemed to realize the proper approach. We got back in the big truck and headed down, matching the other vehicles’ speedy descent. And aside from a couple of switchback turns when my eyes nearly popped out of my head, we got to the bottom without any issues! 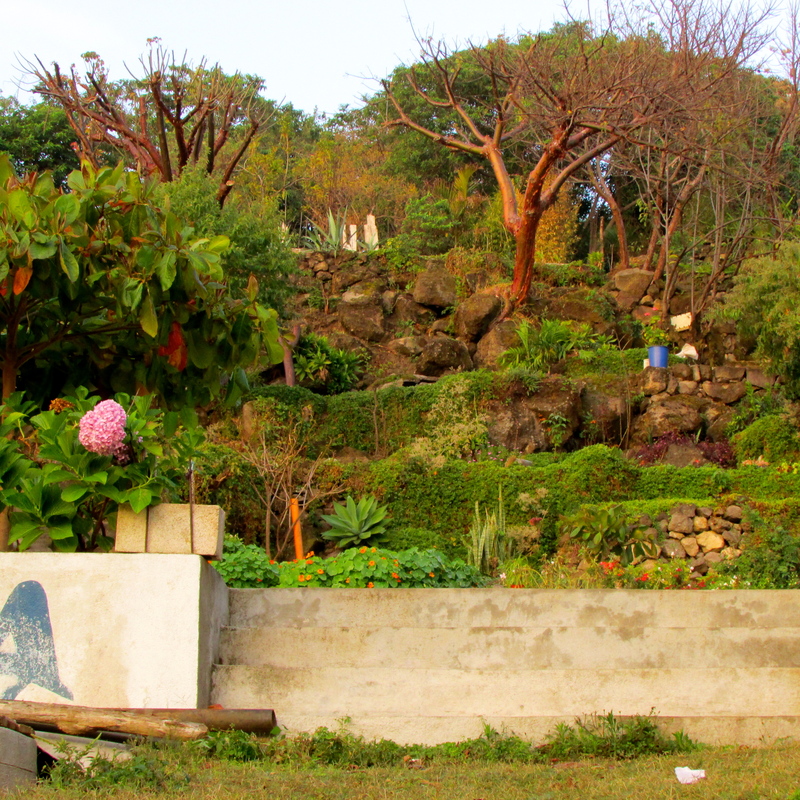 San Pedro La Laguna is a pretty special place, even for us dogs. The town is a perfect mix of travelers from around the world and Guatemalans who still stick to their Mayan culture. Smells of cooking linger in the air along with that special, sweet smell of burning garbage we’ve found at every stop along the way. And the dogs live the life here! Although they’re not as lucky as me, with my bed and my special food and My Family to snuggle with, they all seemed pretty happy. We drove through town and pulled up in front of Corazon Maya, the Spanish school where we were going to stay for the next week. As always, I thought we were going to camp out, but my heart leaped when I saw we were going to stay in a little house! It had a yard all our own, a cool porch for lounging, and plenty of nice neighbors to pet and scratch me. There was even a camp dog who was super nice, and didn’t mind me sniffing around at all. We settled in for our first night in San Pedro, with our camper safely parked up the hill. Our casita at Corazon Maya, complete with our own front yard! The next day we got up and out pretty early, so we could explore the town. Our first stop didn’t pan out so well (no dogs allowed at the pool with the yummy barbecue? ), but the day was full of fun exploration. San Pedro is almost like two towns in one. Up the hill is ‘Centro’, where all the locals live and shop and pass the time. Down the hill by the lake are the super cool walk streets, which everyone calls ‘Gringolandia’. It’s nothing but shops, restaurants, bars, Spanish schools and happy tourists lounging by the lake. I got to wander with My Family pretty much everywhere (they love dogs here! ), close enough to the lake to enjoy the breeze, but far enough away that I surely wouldn’t have to swim. Locals and tourists alike were all super nice and friendly, and since a lot of people come to this town to take Spanish classes, all the people were super patient with My Family’s attempts at communication. Grindolandia. It’s so beautiful here and full of delicious smells. We fell into a nice routine during the next five days. In the morning, Jason and Victoria went to Spanish school. I usually came with them, running from one little room to the other so I could get good lap time with both of them. It was pretty funny listening to Jason try and speak spanish for four hours a day! Victoria was definitely better, but I think I understood the teachers better than either one of them. In the afternoons I would relax on the front lawn while Jason worked. And in the evenings we would go out to explore, eating yummy food, meeting nice people and enjoying the cool weather by the lake. After our second day of Spanish school we met a couple of super nice campers named Kenny and Jenn. They’ve been traveling as long as we have, and also came from California! It was pretty cool to meet people who knew about my home, and we hung out with them a lot. I didn’t always get to go out with My Family as they wandered around town, but even when I was left at home I didn’t mind. We had a comfy bed, and I felt super safe in this place. I knew we weren’t going to stay forever, but I was very happy when My Family decided to stay and spend a second week in this great place. This guy lives at Corzaon Maya and is really chill. I repeat, he lives at Corazon Maya. Not with us. The days passed quickly here. Jason got to experience a little more of the Mayan culture, taking part in a couple of ceremonies to mark the new year on their calendar. I got delicious bits of bacon when we went out with our new friend Benjamin to an all you can eat brunch! Victoria spent a lot of time reading on our front porch. I got to eat fresh banana bread! Jason and Victoria went out with Kenny and Jenn, ran around in the rain, and tried delicious restaurants basically all the time. I got to chase a cat around Corazon Maya. All in all, a perfect week. Things changed really quickly, and I had no warning at all. One morning, Jason and Victoria left me at home for quite a long time. I knew they were planning on visiting another town along the lake called Santiago, so that they could help some of the local dogs and cats. Before the Big Adventure Victoria had found an organization called Ayuda Perros Y Gatos, run by a nice woman named Selaine right here in Lake Atitlan. They take sick dogs and cats off the streets and give them medicine. Apparently, those dogs I kept seeing roaming around weren’t as well off as I thought. Nobody takes care of them, so they don’t feel very good. Jason and Victoria left me at home so they could help take care of some of these animals. They came home, and I was super happy to see them. Then I noticed a new smell coming in with them: another dog! Maya, Maya, Maya! Not only does she cry, poop and pee all the time she also steals my toys. My family thinks everything she does is cute. My Family never asked my opinion, which I surely would have given them. 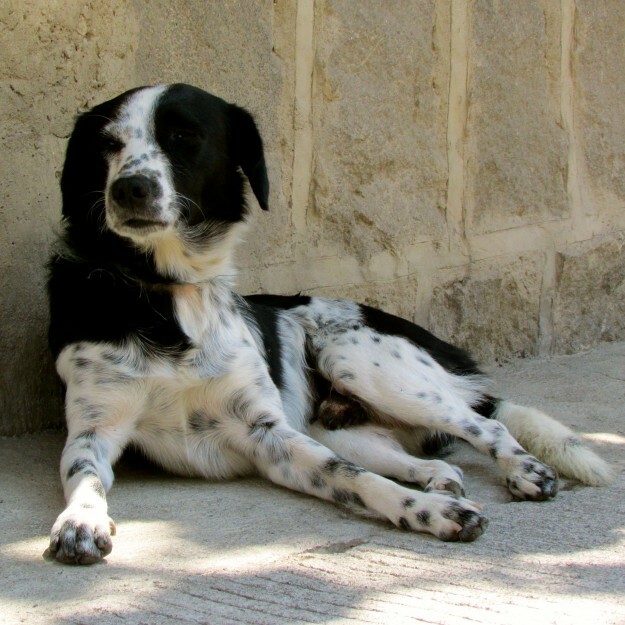 They just went and decided to bring one of these Guatemalan dogs into our house! 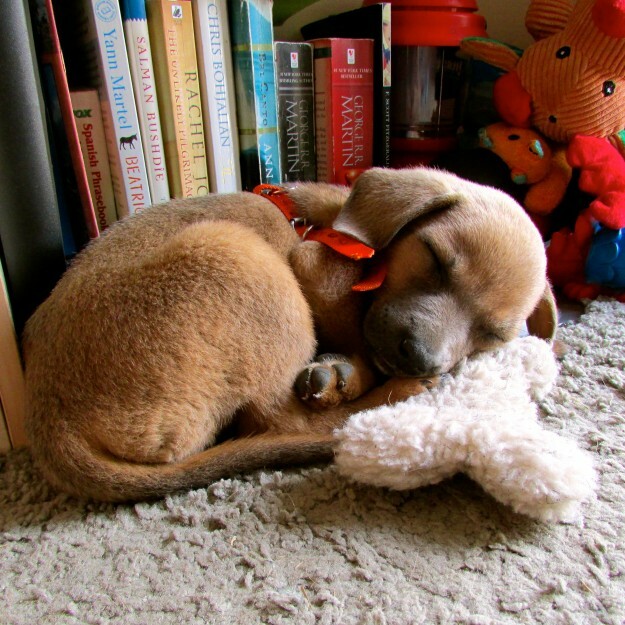 Her name is Maya, and she’s just a puppy. She doesn’t know how to do anything right, and basically they expect me to welcome her into our family? At first I thought that maybe she was just going to spend the night, until she started to feel better. But the days kept passing, and every morning she was still there! Not amused. At the beginning of this post I mentioned there were two things I don’t like: Large bodies of water and Surprise Siblings. Since we now had this interloper with us, Victoria and Jason decided to spend one more week in San Pedro. This little whiner who just pees and poops all over the place ALSO needs all sorts of shots and medicine! The plan had been to head off to the beach, but because of Maya we were staying on the lake instead. Our Spanish lessons were over, however, so it was time to move on. My Family found another place to park, outside of a coffee shop in the middle of Gringolandia. That’s right. I lost my front lawn AND had to deal with a puppy all at the same time. The coffee shop was pretty cool, though. I had room to run around, and there were some super nice campers there as well. Henry and Kristina came all the way from Canada in a minivan, while another couple was here from Germany. Sweetl! Everyone was super nice, but that didn’t make up for the fact that this stupid puppy was now always around. In fact, people started saying hello to her before even noticing me! C’mon, I’m seriously the cute one, right? Just because Maya’s small doesn’t mean she’s cute. She doesn’t do anything! Even worse, there were a bunch of nights when Jason wasn’t snuggling with me in bed any more. 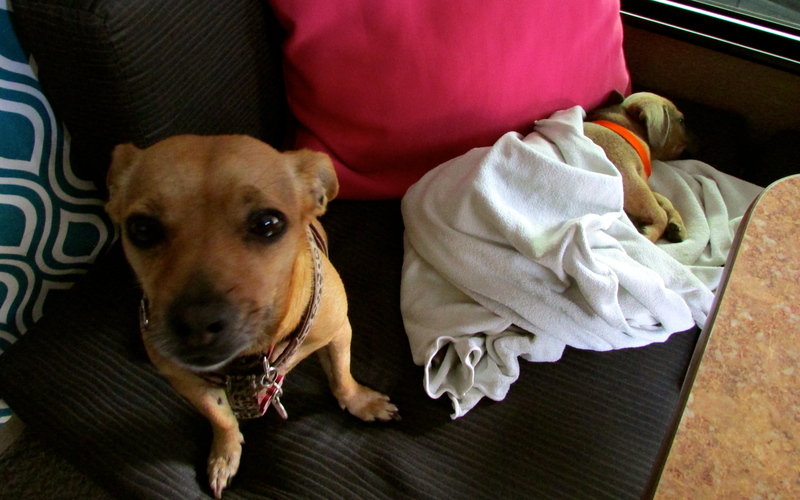 The puppy is so whiny that Jason ended up sleeping on the couch with her. Seriously, I don’t know what My Family was thinking. 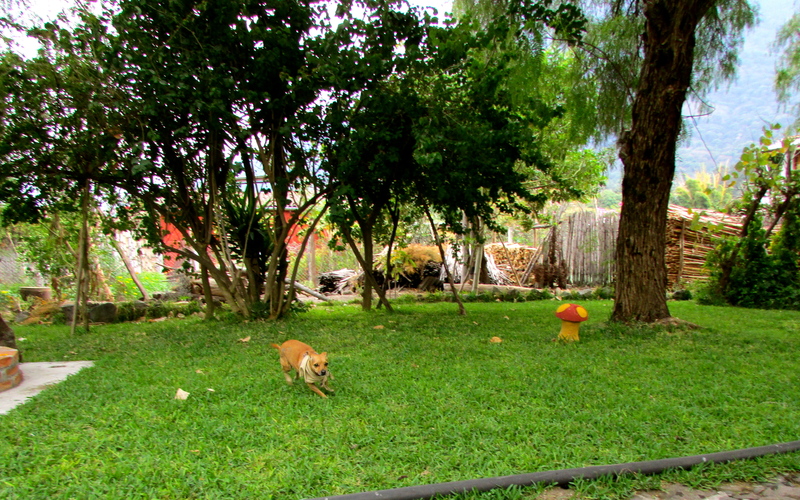 The gardens at the coffee shop were really fun to run around in. Plus? Maya can’t get up stairs! Finally, it was time to leave San Pedro, and since we had spent an extra week there it was also time to leave Guatemala. Now the real shocker: Maya came with us. We missed out on the beach, AND I apparently now have a sibling to deal with. I really REALLY loved Guatemala, and My Family felt the same way. This ‘Maya’ situation, though, was about the most unwelcome surprise I could imagine. PS: To see some photos My Family took click here. The true story of a small dog overlanding Mexico and Central America. We are currently in: Topanga, CA, USA!